Five Easy Halloween Party Ideas! 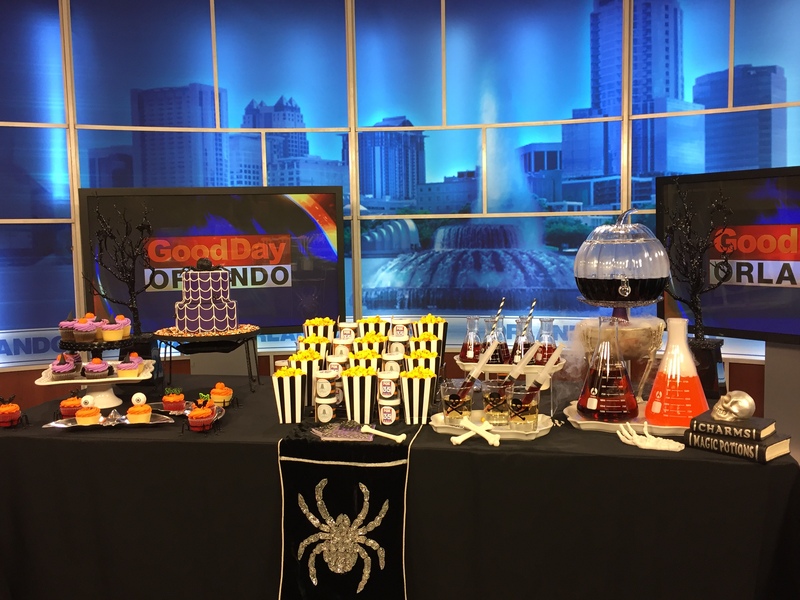 Table Design: You don’t have to add a lot of décor to create a spooky and dramatic look. Stick to two main colors to create the look and then add in an accent color to make it pop! 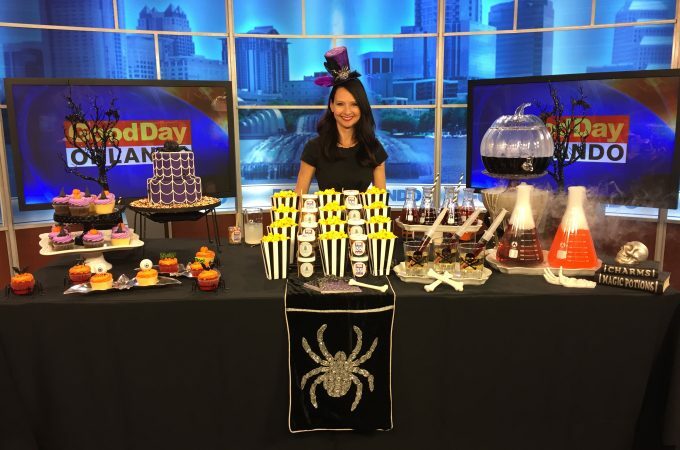 I used a simple black tablecloth and black and white serving trays and cake plates with a moody accent of purple for a “Spooky Glam” feel. Then add some shiny silver serving pieces for some depth and ghostly glamour. *Pro Tip: Use different heights to elevate your food. It not only gives the table some depth and visual interest but you can fit more on the table as well. 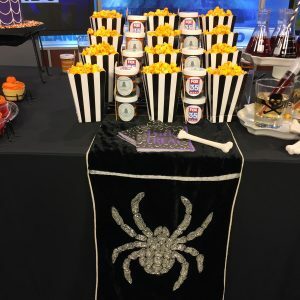 Halloween is all about sweet treats so I loved the idea of putting together a decadent dessert table that allows your guests to over indulge on grown-up Halloween candy. But, that really is part of the fun, isn’t it? 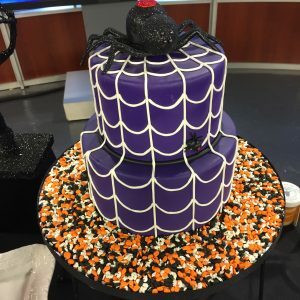 Spooky Statement Cake– A statement cake really anchors your dessert table and also adds to the décor with the theme. 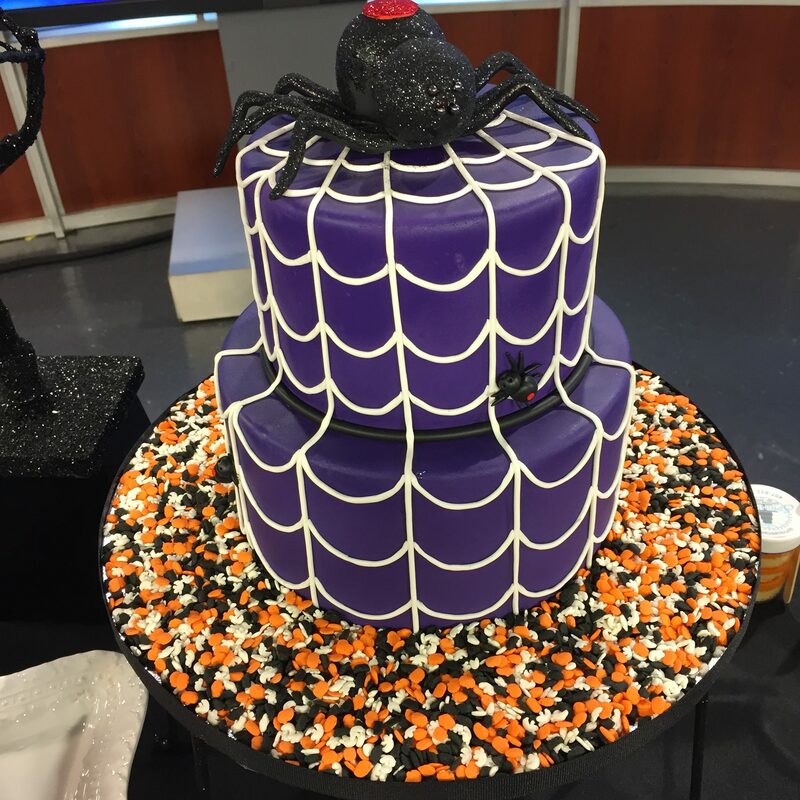 I used a fun two-tier purple cake accented with black spiders from Sprinkles Custom Cakes in Winter Park. 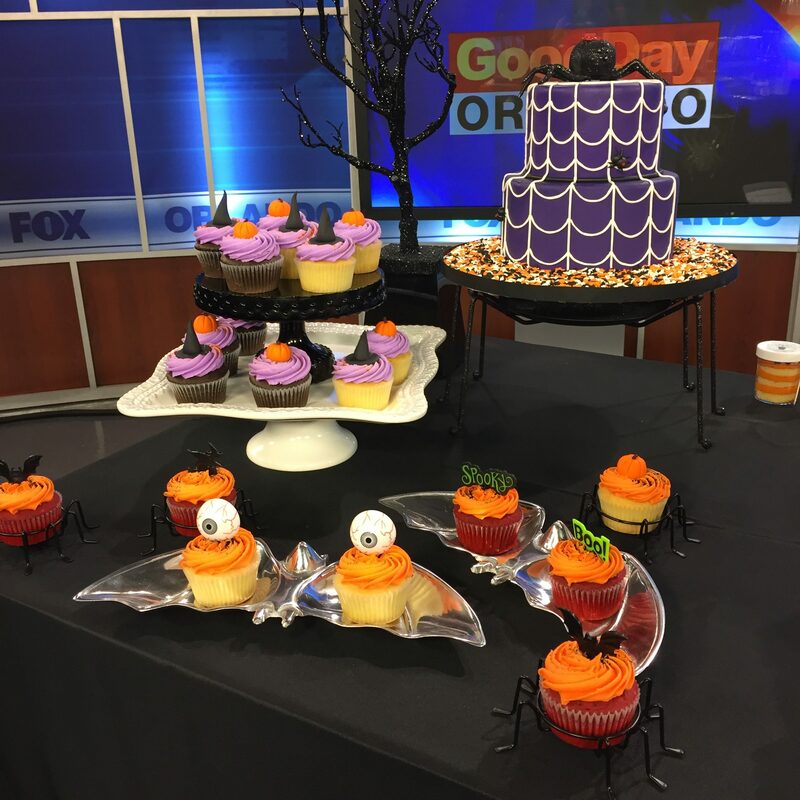 Cupcakes – Cupcakes are always a hit at celebrations so why not make or buy cupcakes and then add some Halloween themed toppers as a great “grab and go mingle” item for your dessert buffet. 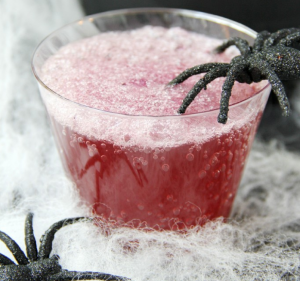 Spooky Shirley Temple – This is a non-alcoholic version for the kids or guests who don’t drink but still want to join in the fun! 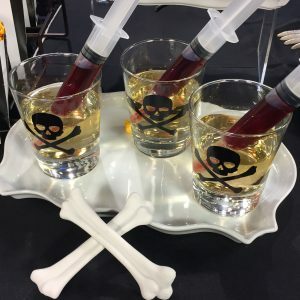 Fill glasses with gingerale and then medicine or jello shot syringes with grenadine to look like they are filled with blood. 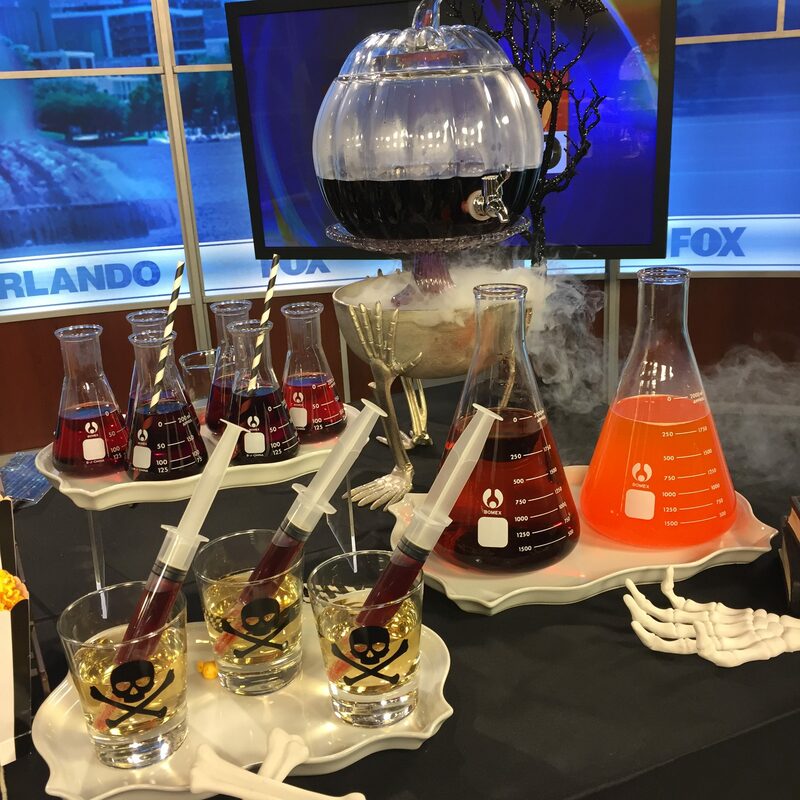 Set the filled syringes in the glasses and set them out… Guests will enjoy the spook-factor and dispursing the “blood” into their drink! Pour sprite over ice and garnish with a bloody (grenadine) syringe. 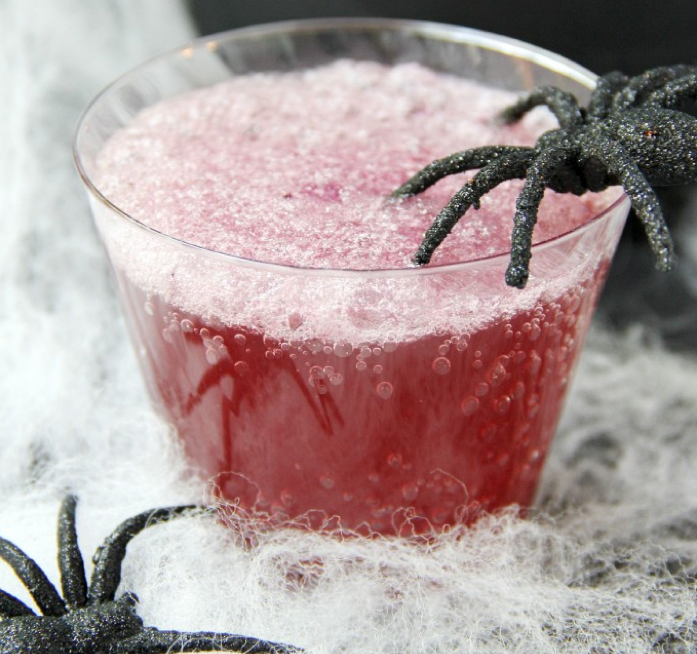 Hocus Pocus Punch – You can batch any version of your favorite alcoholic punch drink into a large bowl so it is pre-prepared and guests can help themselves throughout the party. Use a larger bowl and place dry ice in it. 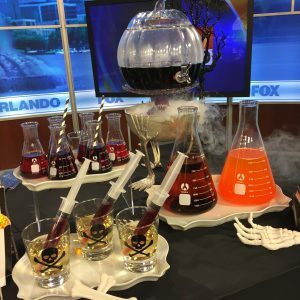 Set your punch bowl into the larger bowl on top of the dry ice and then right before guests arrive pour some water on the dry ice for a super smoky and wicked Halloween party effect! To an 8 oz. cup, add 1/8 cup lemonade, 1/8 cup cran-pomegranate juice and optional vodka. Combine 3/4 cup ginger-ale to the lemonade and cran-pomegranate juice. Add the JELL-O and watch the hocus pocus bubble and brew happen! Notes: If your drink isn’t fizzing, add more ginger-ale! 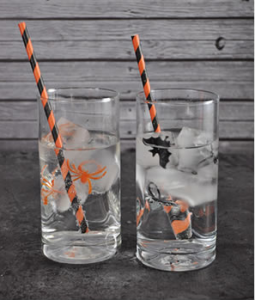 Spider Ice Cubes – What Halloween Party is complete without spooky ice cubes? Buy a pack of black spider rings. Wash them in soapy water and then cut the ring part off of the spiders. Fill an ice cube tray with water and place a spider in each cube. Freeze and then serve Spooky Spider Cubes in all of your drinks! Dry Ice Tip: This is an important tip if you are going to use dry ice! Handle it carefully and properly… Do not touch it with your bare hands or use it in a way that a guest could ingest it. It can severely burn you so handle only with gloves or tongs and make sure guests can’t swallow it if you use it in a drink. 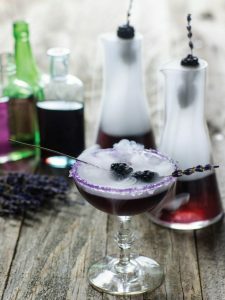 I recommend putting the dry ice in a bowl underneath the punch bowl so it isn’t actually in the punch. That way you can ensure the safety of your guests but still get the goulish effect you are going for to impress them! Where to find it? Call your local grocery store. I found mine at Publix for 1.49/lb so it’s really affordable. 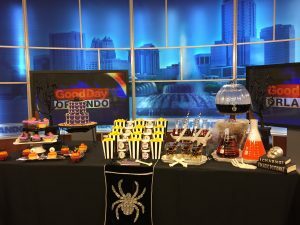 Just saw your segment on Goid Day. Love all your display ideas!